The ِAleppo Pine (Pinus halepensis) is an evergreen pine that is native to Jordan. 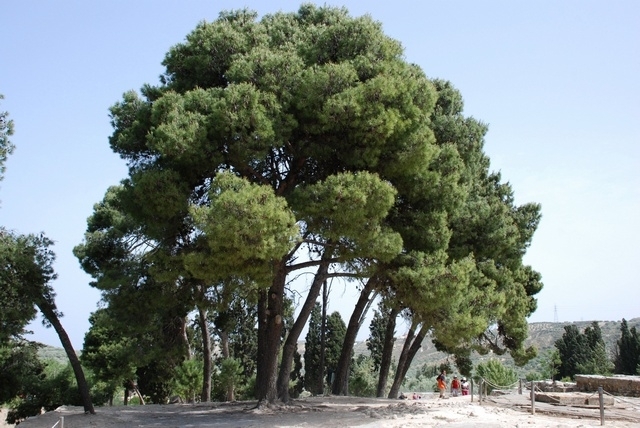 It is one of the most common pines in the Mediterranean region. It can form extensive forests, and therefore is used widely in reforestation efforts. It can be found in some of Amman’s older gardens, where this large tree forms a dominant attraction. It grows to a height of up to 18m, with a spread of 10m, and has a moderate growth rate of about 25cm per year. The Aleppo Pine grows in full sun and is very heat and drought tolerant. It also is highly tolerant of wind exposure, salt spray, as well as soil salinity and alkalinity. It can survive in any type of soil, including rocky and extremely poor soils, but prefers well-drained soils. Requires no watering once established. Generally, trees need supplemental irrigation to get established, especially if planted after the rainy season. During the first year, irrigate in the amount of 20 – 25 liters of water twice a week. During its second year, a tree needs to be irrigated in the amount of 40 liters once a week. Beginning with the third year, trees usually get established, and some, like the Aleppo Pine, do not require any supplemental irrigation. This evergreen pine grows into a large tree with a spreading crown and large lateral branches. The long slender 6.5 – 10cm needles grow in bundles of two. The flowers on the same tree are either male or female, and are wind pollinated. The Aleppo Pine produces 7.5cm long, oval to oblong cones that are reddish to yellow-brown. Native tree; good for windbreaks, and in forests and parks. Lower branches may be trimmed in late winter to encourage tall growth. Its leaf and cone litter produce a thick carpet on the ground. The Aleppo Pine often is planted to help achieve soil stabilization. It is used in leather tanning, production of dye, and resin extraction. It also has various uses in folk medicine.